Al Mughayyir, Occupied West Bank: A gang of a dozen or so armed Jewish colonists descended from a hilltop illegal outpost to the Palestinian village below and opened fire, witnesses said. Israeli occupation soldiers arrived, and instead of stopping the colonists, the witnesses said, they either stood by or clashed with the villagers. The killing last month was the latest in a wave of colonist violence. Attacks by colonists on Palestinians, their property and Israeli occupation forces increased by 50 per cent last year and have threatened to ignite the Occupied West Bank, Israeli occupation officials say. Days earlier, the Israeli authorities charged a 16-year-old yeshiva student from another Jewish colony with manslaughter and terrorism, accusing him of hurling a 4-pound rock that killed Aisha Al Rabi, a Palestinian mother of eight, one night in October as she rode in her family car along a nearby highway. While Palestinian and United Nations officials have condemned the violence—Nickolay Mladenov, the UN envoy to the Middle East, described the shooting in Al Mughayyir as “shocking and unacceptable”, Israel’s right-wing government has remained conspicuously silent. In 2015, after a Palestinian home in the village of Duma was firebombed in 2015, killing a toddler and his parents, Netanyahu and right-wing leaders issued strong condemnations and said Jewish terrorism would not be tolerated. This time the loudest voices have risen to the defense of the Jewish suspects. Palestinian President Mahmoud Abbas blamed the Israeli government for allowing the situation to escalate. “This is a continuation of Israeli policy and will lead to further tension and create an uncontrollable atmosphere,” he said. Israeli officials partly attribute the surge in colonist violence to the recent lifting of restrictions from some main extremists. The group seeks the collapse of the state of Israel and its replacement with a Jewish kingdom based on religious law. The extraordinary steps included administrative detentions and orders keeping key radicals out of the West Bank. Those temporary orders have now run out which explains the surge in Jewish terrorism. Residents of Al Mughayyir said armed colonists first came down the hill and vandalised a tractor, smashing its windows and puncturing its tires. Farmers ran to ask some soldiers stationed nearby for help, but the soldiers told them to call the police. 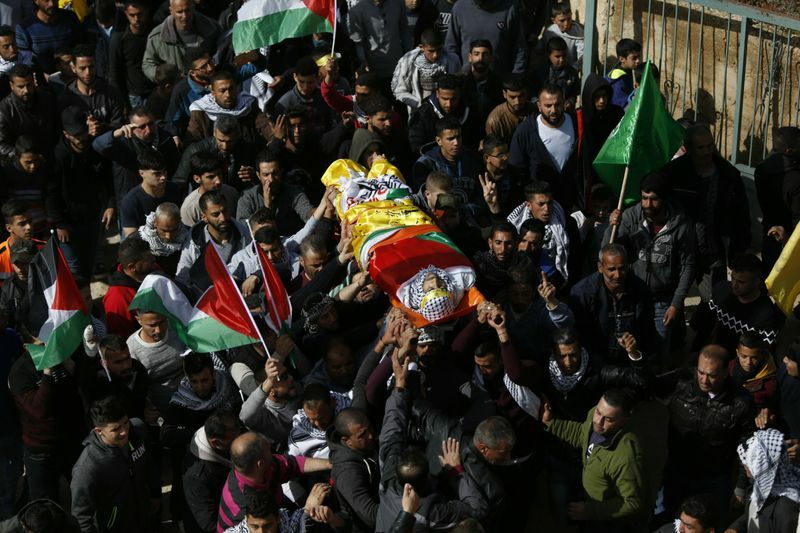 Naasan’s cousin, Yasser Naasan, 34, said he went to check on the tractor but more colonists arrived, fired at him and chased him back to the village. The mosque loudspeakers called on residents to come out and defend their homes. 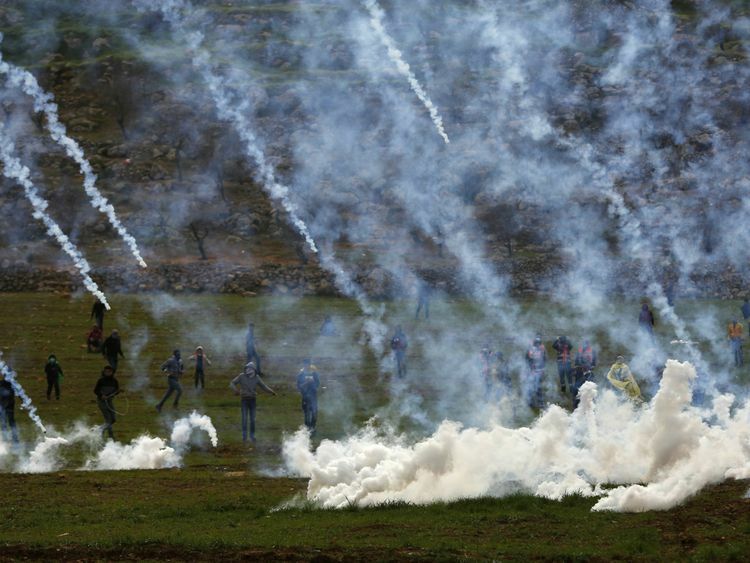 Witnesses said occupation soldiers arrived and fired tear gas, stun grenades, rubber bullets and possibly live bullets in the air while colonists shot live ammunition. One resident showed photographs on his cellphone of armed colonists standing shoulder to shoulder with soldiers, and some colonists wearing masks. “I witnessed a battlefield,” said Farraj Naasan, 53, an uncle of Hamdy Naasan. Naasan fell about 50 yards from the last home on the edge of the village. Another witness, Samir Abu Alia, 53, said villagers had to wait 20 minutes, until the shooting subsided, to retrieve his body.